When you find out you’re pregnant, you suddenly have to make a bajillion decisions. Baby names, choosing doctors, various tests, cord blood banking, etc. etc. etc. And, one of my favorites: what will the nursery look like? Will it be bright and colorful, sweet and soft? Gender neutral, or a pink or blue explosion? If you’re looking for some inspiration, I’ve found 10 crazy fabulous nurseries to admire! This is one of my favorite nurseries. 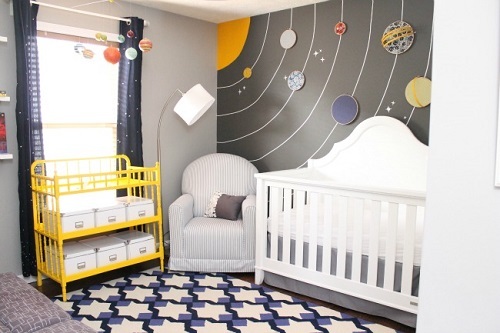 That dramatically dark gray wall makes all of the fun colors in this nursery pop! It looks put together, but not matchy-matchy at all. Plus, I have a huge crush on that fabulous rug. Holy colorful, Batman! 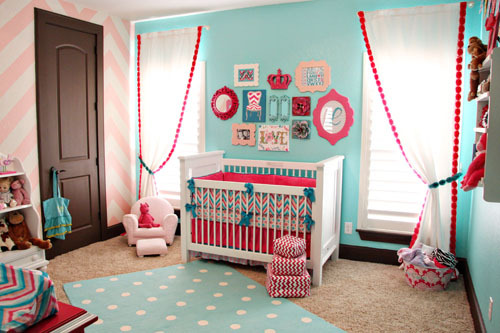 The contrast of the soft pink chevron wall to the super bright pink and blue touches make this nursery a sight to behold. 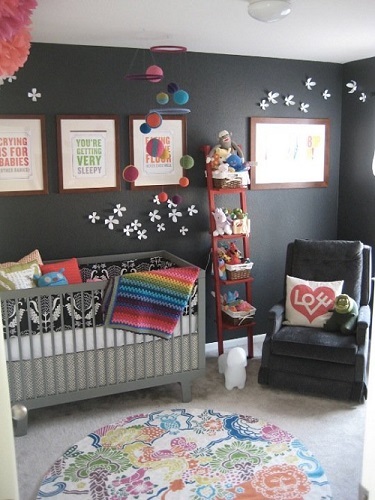 The collage of pictures above the crib and the fuzzy carpet add a unique richness for a child’s room. 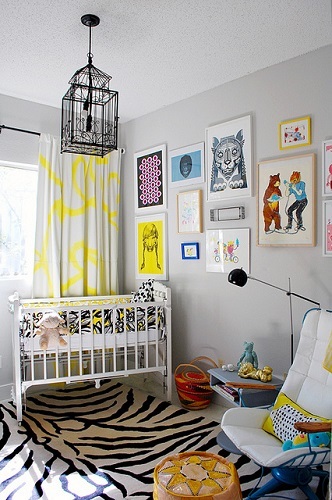 A gorgeous modern nursery that could work equally well for a baby girl or boy. The colors and textiles pop against the stormy gray walls. The homemade cornices draw your attention to the crazy beautiful windows! The monochromatic color scheme allows your eyes to be drawn to the beautiful star details on the ceiling. I adore the Moroccan style pouf! I can’t imagine how much work that quatrefoil wall was, but it was certainly worth it! 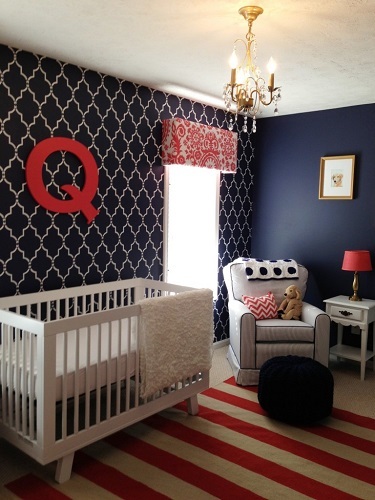 The effect is amazing, and the bold pops of red over the navy blue makes this nursery look luxe without being fussy. My little geeky heart pitter-pattered at the sight of this celestial nursery! I like the mix of old and new – the curved lines of the traditional crib with the darker walls and geometric pattern in the rug. This nursery is as sweet as they come – soft pastels and plush textiles create a relaxing and pretty room, perfect for a sweet little girl. The Ikea lamp adds some whimsy! 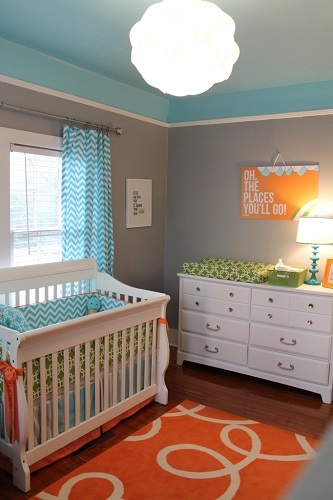 Somehow the mix of patterns and colors in this nursery just works. Keeping everything simple and clean allows the bright colors to shine. Plus, every nursery could use a Dr. Seuss quote! Now, these parents have some serious style! 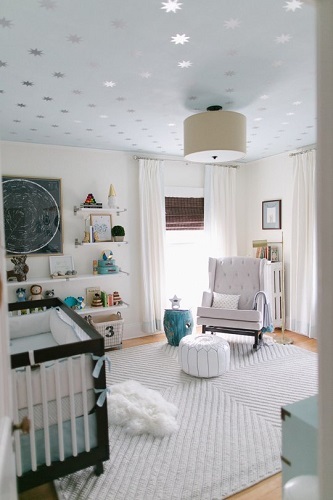 I love how this room is totally appropriate for a wee babe, but proves that nurseries don’t have to look babyish. Fun prints and bright yellow create a fun, stylish atmosphere. This nursery makes me feel all warm and fuzzy. 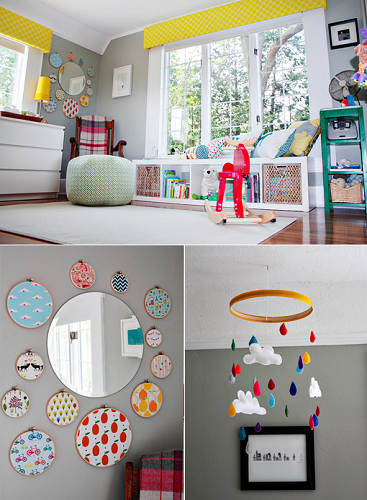 The cloud details are whimsical and sweet and I love using cute, little baby clothes as part of the decor.